Dry, Flaky Kids Scalp | Kids' Hair Inc.
Common with babies and toddlers, Cradle Cap is a crusty, dry, scaly and sometimes yellowish rash on the scalp. Cradle Cap is harmless and usually goes away over a few months but sometimes persist into the toddler or childhood years. Although an exact cause is unknown, it is likely that Cradle Cap is caused by an over production of the oil glands in the scalp due to hormones, sweat or even regular shampoo. It is not caused by bacteria or poor hygiene. 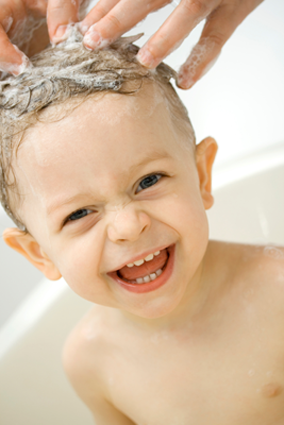 Most cases of Cradle Cap just need to be carefully washed with a gentle shampoo. We recommend Paul Mitchell’s Baby Don’t Cry which contains Chamomile and Corn Flower extract to calm, soothe and relax the oil glands in the scalp. Using a washcloth or even a very soft toothbrush, rub a small amount of the shampoo on the Cradle Cap. Let the shampoo sit on the scalp for a few minutes. Then, gently massage the scalp to loosen the Cradle Cap. Never pick at the scalp, this can cause sores or even temporary hair loss. Finally rinse the hair with fresh water from the faucet. DO NOT scoop water out of the bathtub, bathwater is full of oils, just what you are trying to get out of your child’s scalp. *If your child’s Cradle Cap is severe or spreading to other parts of their head/body, see your pediatrician.